Fixed Gas and Refrigerants detection system. 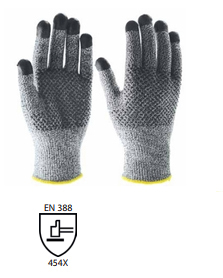 WORKSafe DN3003 Glove Clearance at ONLY SGD 6.50 /pair! Possessing a unique blend of 13-gauge High Performance Polyethylene (HPPE) and fiberglass, these seamless knitted gloves come with nitrile dots on the palm and nitrile-coated fingertips for enhanced dexterity. The gloves provide excellent abrasion and cut resistance, and comfort with breathability. They are ambidextrous and can be worn on either hand. *While stocks last. This promotion cannot be used in conjuction with other promotions. PDS International is the preferred supplier of safety glasses, safety prescription glasses, safety shoes, harness, lanyards, gloves, fire resistant clothing, safety cabinets, spill control products, gas detectors and other PPE and safety products.